Why become a member of Zea Mays Printmaking? Our membership year runs from September through August. Memberships are by application, which are reviewed in August. 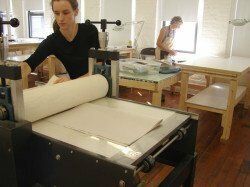 Potential members need to demonstrate a basic knowledge of printmaking techniques, and a desire to work in a community with a focus on sustainable art making practices. All Studio Memberships are a 12-month commitment beginning on September 1st. access to all presses and plate making facilities, scanners, dryers, etc. Limited and Low Use members can carry unused studio hours over to subsequent months within the membership year. Supporting members contribute to the mission of Zea Mays Printmaking. Supporting members are invited to submit work for our Flat Files at which time they pay a $100 Flat File Membership fee. All members are expected to understand and adhere to these basic agreements, and to sign a contract.